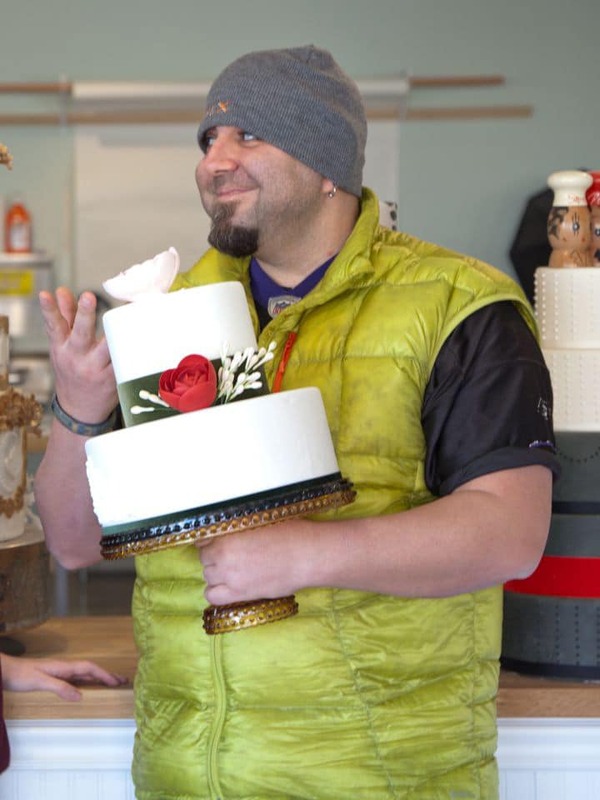 You’ve got to love Duff Goldman. He approaches Judaism, cakes, art and music the way he approaches life, with his whole heart and a sense of humor. Originally from Baltimore, Duff opened a bakery in 2002 called Charm City Cakes. 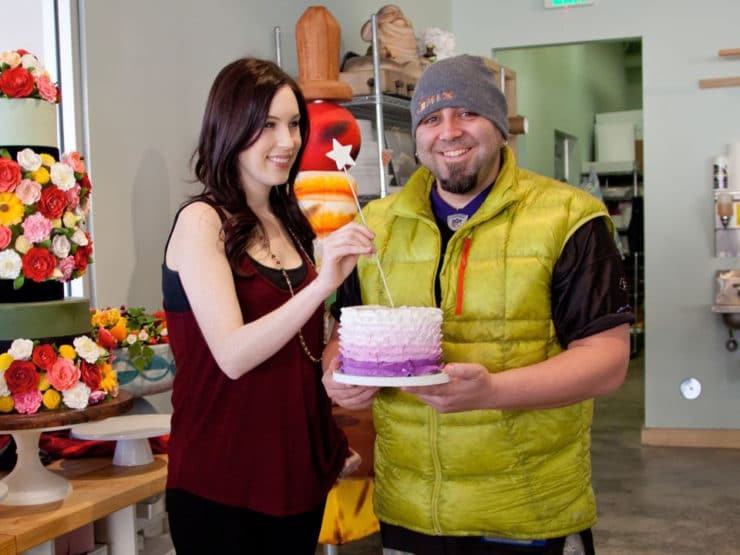 This led to a starring role in the popular Food Network series, “Ace of Cakes.” Duff has since become a world-renowned cake decorator and cooking personality. In addition to his cake career, Duff is a Culinary Institute trained pastry chef, metal sculptor and bass player. He’s appeared on numerous TV shows and cooking competitions. Did I mention he’s also a graffiti artist? Duff’s newest venture is Charm City Cakes West, his second bakery located in West Hollywood, CA. 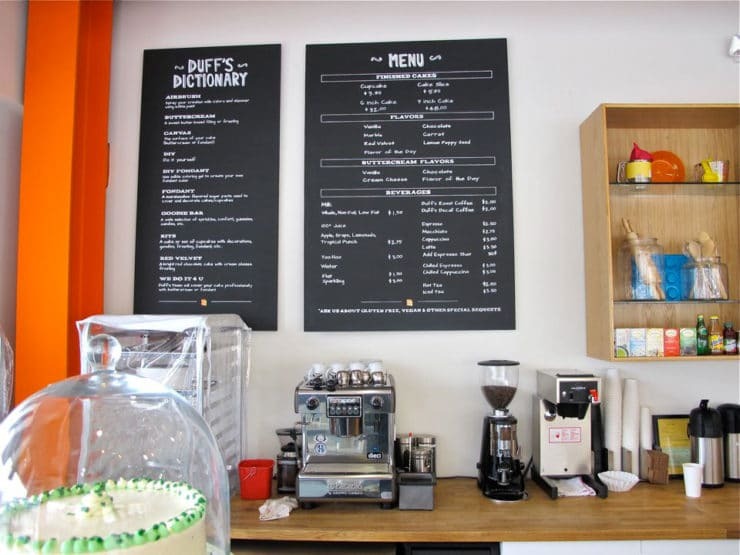 Next door is Duff’s Cakemix, a high concept space where customers can come to decorate their own cakes. It’s sort of like Build-A-Bear, but instead of a stuffed animal, you get an undecorated cake—a blank canvas where you can unleash your inner cake artist. 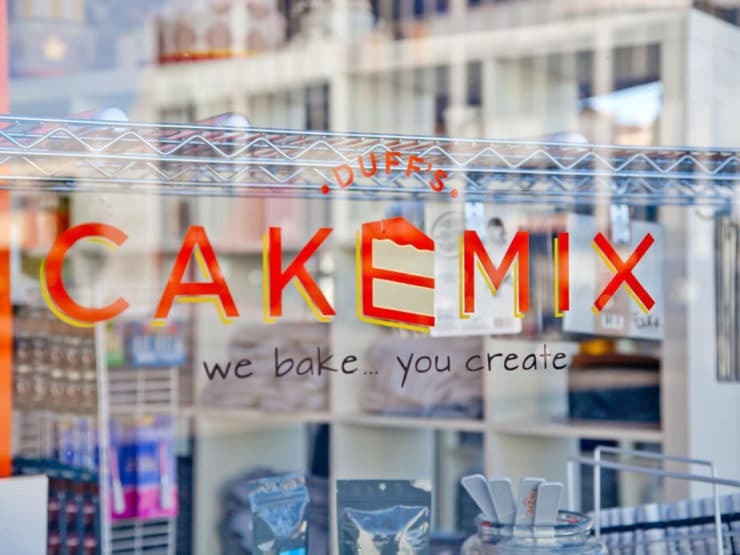 Duff’s Cakemix is filled with colorful ornamental elements to inspire all kinds of unique, personal creations. 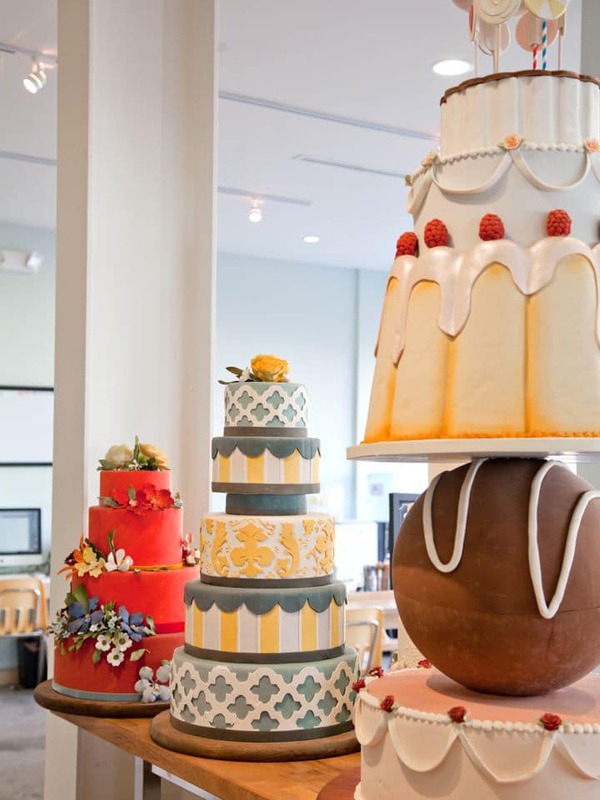 First, you choose a cake size, flavor and filling from a menu of tempting options. Next you choose a “canvas”—buttercream frosting or smooth fondant, in the color of your choosing. 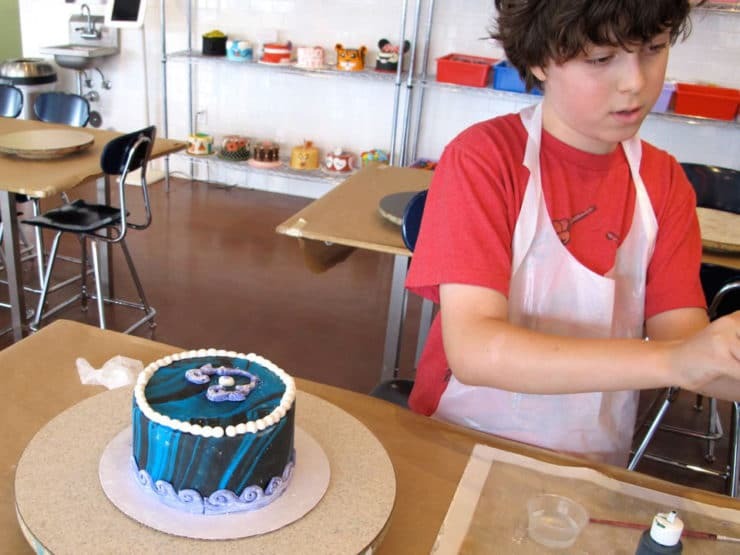 You also choose frosting or fondant colors to embellish your creation. 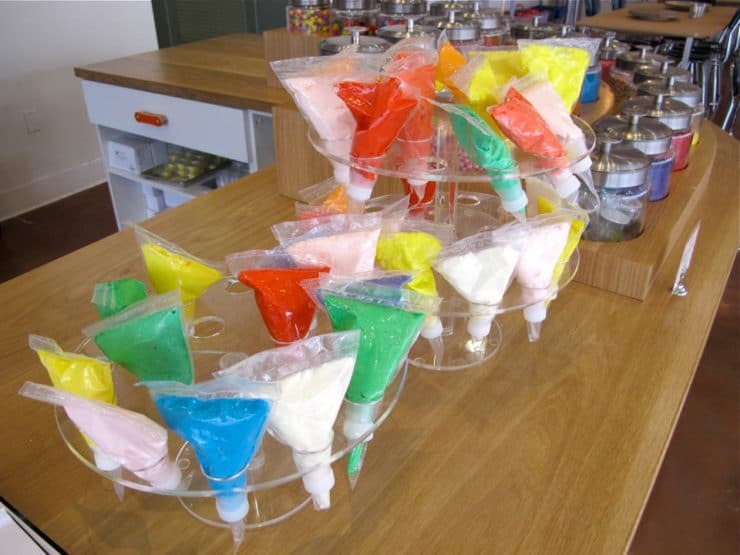 Next, pick up some decorations from the Goodie Bar. Finally, you can choose to add some “extras” to the cake—more advanced, exciting stuff like airbrushing, cake toppers, and my personal favorite, edible glitter! Customers can play for hours with their creations. This boy decided to make an “Underwater Cake.” I was very impressed. The Cakemix staff is always on hand to help customers out. If you’re less hands-on, you can describe what you want to the Cakemix staff, then have them create a cake right in front of your eyes. Or, you can head next door to Charm City Cakes West, where Duff and his friends will help you design the custom cake of your dreams. 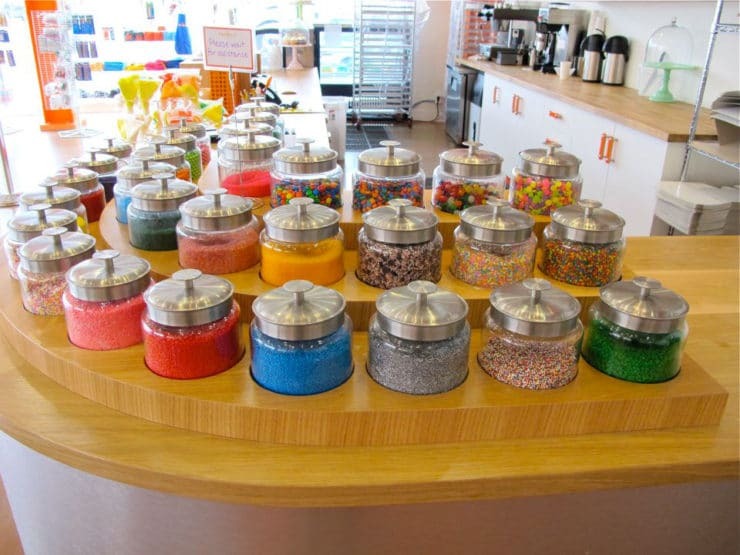 Duff’s Cakemix is the perfect place to host a birthday party or celebration. And if you’re lucky, you might just run into Duff there! I recently sat down with Duff at Cakemix to talk about his new bakery, his rise to culinary fame, and his family food story. He also shared his grandma’s recipe for Beef and Barley Soup. I learned that while he may be an international cake star, Duff is really a Jewish kid from Baltimore at heart. I’m not at all a cake decorator, so this is all very new to me. If you’re crafty or visual, you can do it. The first step is picking it up and actually doing it. It’s not as hard as you’d think. It’s super fun. It’s one of those things that you can really get into. You can measure and see yourself getting better and better. I think that’s why it really hooks people. The whole reason for building this place was because I wanted people to feel that same sense of accomplishment that we do. Every Friday when all of our cakes are laid out and we see them all, you look at your body of work that week and it’s really inspiring. All week you’re focused on this cake and on Friday you take a step back and see everything everyone has produced, and you’re amazed. When people come in here and they can experience that, it’s nice. What’s the first cake you ever decorated? Probably when I was a little kid. I was an Indian Guide, it’s like a boy scout, the Native American version of boy scouts. My tribal name was Snowy Owl. So, when I was a little kid I helped decorate my birthday cake and it was a big snowy owl. I was about 8 maybe. I heard that you were once the personal chef for an Orthodox family. They were not Orthodox. They were very conservative. So, four sets of dishes, all of the meat was glatt kosher. Shlomo’s Kosher in Reisterstown. The butchers are very Orthodox and hilarious. We had this Seven Mile Market and there was a big kosher market. I used to go there and buy a lot of things I would cook with. The super cute Orthodox girls would be there and they would be looking at me. I was like the bad boy. I think I was like 24. And how old were you when cake decorating became your thing? 26. I quit that job on March 3, 2002. Yeah. It was time for me to not work for anybody and see if I could do this for myself. Really, at the time I was trying to be in a band. I play bass. I almost left to go play bass with this band Juno in Seattle. They rocked my face. And then I played with a band called Elliot from Louisville. They became one of my favorites. We were kind of emo-ish, emo meets The Who. So that’s what I wanted to do. I wanted to play music in the later part of my early 20s. We really tried. We toured all over the place. Making the cakes was something I did on the side, it was great and I could pay my rent. From July to September I didn’t make any cakes because I was on the road. So making the cakes was fun for you, but it also allowed you to make the money to tour with the band? You grew up Jewish. Does your family like to cook? Oh yeah, it’s a big food family. I think that’s why I got so into it, being surrounded by food all the time. If you grow up in a Jewish house you grow up eating. Not only eating, but you also grow up being in a kitchen all the time. Every holiday is in the kitchen. Mom is standing there trying to cook, everyone else is getting in her way and sticking their fingers in stuff. Any Jewish party ends up in the kitchen. My great grandmother, my grandmother and my mom are all great cooks, so I think it just sort of rubbed off on me. My mom’s side is Russian and Austrian. My grandfather was Austrian; my great-grandma was Russian from the Ukraine. On my dad’s side my grandfather was Russian and my grandmother was Polish. So you have Ashkenazi roots. Lots of heavy comfort food. So what were your favorite dishes growing up? My great grandma made all kinds of good stuff. She made a cholent that I loved. It was a good, hardy, brick heavy stew. Her strudel was to die for. I remember being a little kid and watching her make the dough. I can make filo dough, but I would never do it by choice. 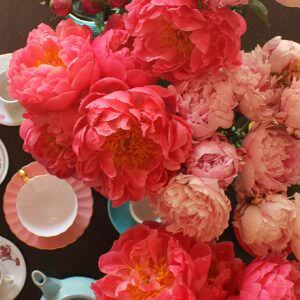 She would start with a little ball of dough and hook it on the corner of the dining room table. She would never roll it, she would just stretch and stretch and the whole time she’s telling me stories and going and going and then it’s all the way to here. You don’t even see her do it, it just sort of happens. It was so good. It was apple with a little bit of shredded pineapple. She would cook down the apples with shredded pineapple. It’s not rocket science, but it was done totally right. My grandma kind of ruined us as kids. She made these peanut butter cookies and they were the best. For me and my brothers it’s the paradigm of a great cookie. Nothing comes close. 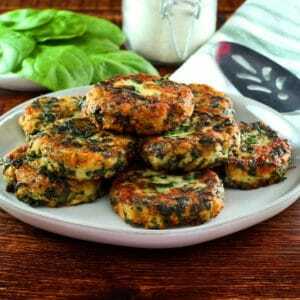 Do you have many of your family’s recipes? I do. I have all of my great grandmother’s old recipes. It’s so cute. She came over from Russia and had a thick Russian accent. She wrote her recipes in English, but phonetically, so she wrote them with a Russian accent. It’s so cool to read them. You have to say it in a Russian accent to understand. Puddle are “poodles.” She talks about brushing the butter onto the filo dough for strudel and she says “No poodles!” for puddles. 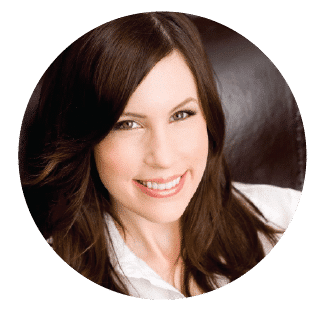 I’d love to feature one of your family recipes on the blog. Do you have a recipe you’d like to share? 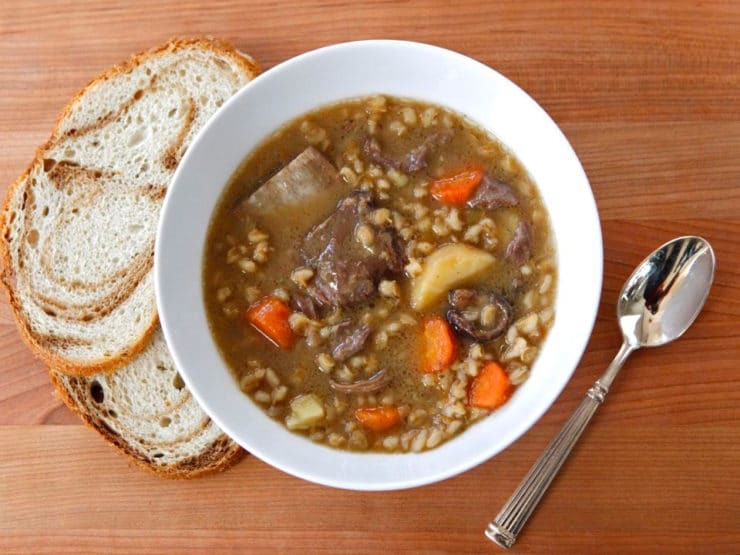 My grandmother had this really great beef and barley soup, like a mushroom and barley with short ribs. It’s one of my favorite things, but it’s sad because the last time I made it, I was a pastry chef at a hotel in Colorado and my grandmother was in Wichita, Kansas. Once or twice a month I would leave the hotel and drive the 10 hours to go stay with her. She wasn’t doing so hot by then. The last couple of times I saw her, the lady who was taking care of her called me and said, “Your grandmother won’t eat.” So I took some time off and went over there and I was like, “What do you want to eat?” And she wanted the beef and barley soup, but the woman didn’t know how to make it. So I spent 2 days and made like 8 gallons of this soup and froze it all in little Ziplocs, so she could pull it out as she needed it. That would last a few weeks, and then I’d come back and do it again. That’s all she ate. That was the last thing I ever cooked for her before she died. I remember when I first made it for her and brought it in, and she was so happy. It was a special time for me. I haven’t made it since. – This soup is best the next day so make ahead! It totally changes overnight. Really, it does! Do not exchange other meat for short ribs – they are sweet and fall apart – so tender after cooked. They’re the ONLY meat I’d use (except lamb if you want an Irish Stew kind of thing). Short ribs are considered flanken (from the lean cow flank) but the ribs are much more marbled than what’s called “flank,” and they make a much more flavorful soup. Cooking with the bones adds all kinds of deeper flavor than just a piece of flank meat. Don’t omit the parsnips, they add sweetness which is a good balance for the nutty barley. The soup is done when the ribs are so tender that they pretty much fall off the bone and shred easily with little effort. They can be served on the bone (which I prefer) or taken off the bone and shredded. If you try this you will love it but don’t mess around with it—it’s perfect like this. I agree with Duff’s mom, the recipe is perfect as written. The only “messing around” I did was to soak the mushrooms and strain them through a coffee filter before adding them to the soup, along with their soaking liquid, so no flavor was lost. 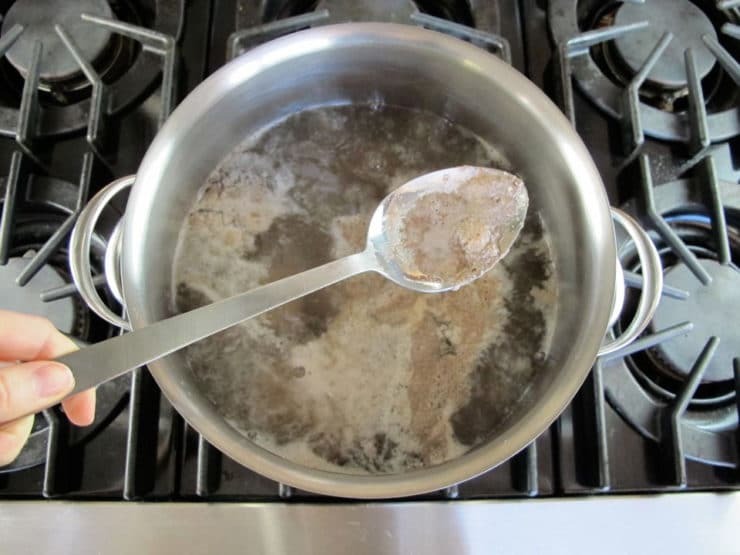 I did this because dried mushrooms often contain a bit of debris, which can make the soup “sandy.” Straining the soaking liquid through a coffee filter will remove any small debris, while at the same time keeping the wonderful, potent flavor from the dried mushrooms. Also, the original recipe didn’t specify what to do with the whole veggies after cooking. I made the assumption that the soup would be best with them in, so I discarded the whole onion and the celery (which had dissolved to strings), then cut up the other veggies and returned them to the pot. The result was absolutely divine… a meaty, salty, nutty, tender, sweet soup that my family noshed on for days. You will love it! Enjoy this recipe, straight from Duff’s family kitchen, and be sure to stop by Duff’s Cakemix next time you’re in town. If you see Duff there, tell him the Shiksa sent you. 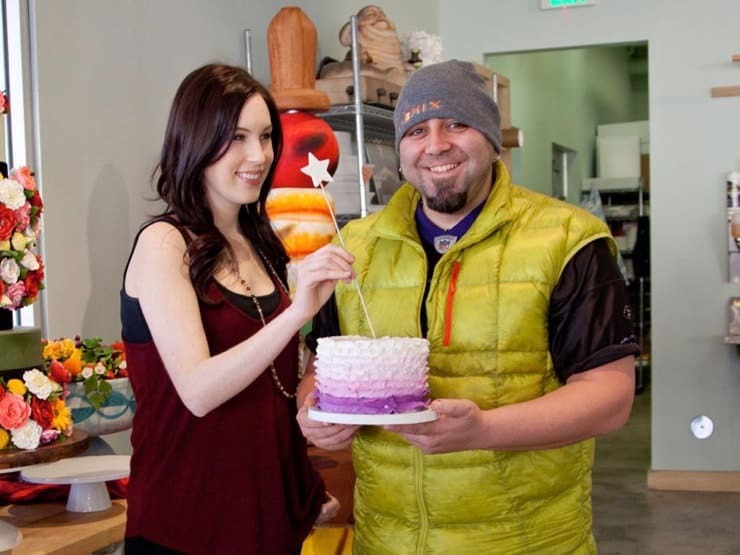 Follow Duff Goldman on Twitter or Instagram. Follow Duff’s Cakemix on Facebook or Twitter. Interview with Duff Goldman about his culinary journey, family food history, Charm City Cakes West, Duff's Cakemix, and his family recipe for Beef and Barley Soup. Place dried mushrooms in the bottom of a saucepan. Dried mushrooms are important here, they’ll give the soup a lot more flavor than fresh ones. You can find them in cellophane packages in the produce section of most grocery stores. Duff’s mom didn’t specify which kind of mushrooms to use, so I chose a combination of shitake and porcini, which gave a terrific flavor to the broth. Add 1 quart (4 cups) of water to the saucepan and bring to a boil over high heat. As soon as the water comes to a rolling boil, remove saucepan from heat and let the mushrooms soak for 20 minutes. 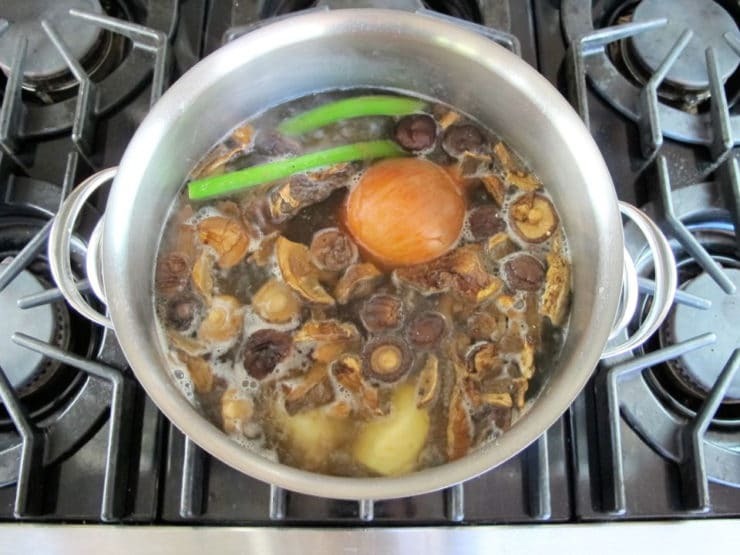 While mushrooms are soaking, place the short ribs in the bottom of a large, heavy pot and cover with 3 quarts hot water. Bring to a boil, skimming the foam that rises to the top, till the water is fairly clear. Add the whole celery, carrots, parsnips, and brown onion to the pot. Bring back to a boil, then reduce to a simmer. 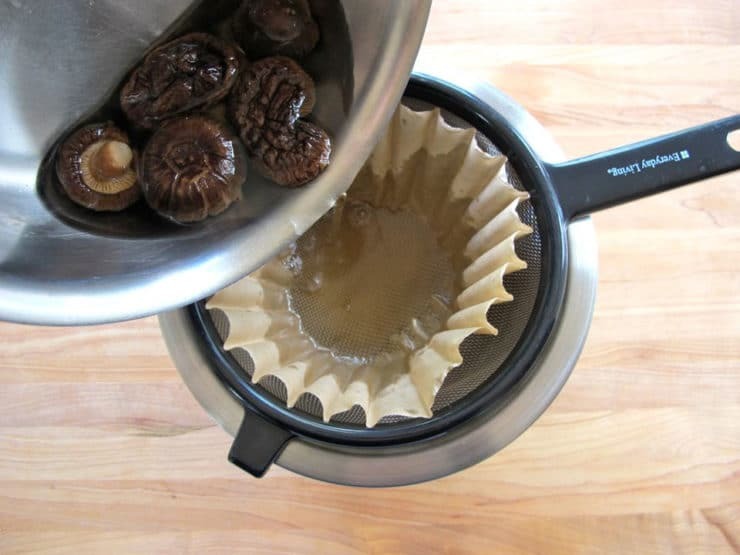 Drain the mushrooms by straining them through a coffee filter, reserving the mushroom soaking liquid in a bowl (use a mesh strainer or colander to hold the filter in place while you strain). Discard the filter, which will contain any residue that was left on the mushrooms. Pour the mushrooms and the mushroom liquid into the soup pot. Add the barley, sugar, ½ tbsp salt, and ¼ tsp black pepper. If you’re salt sensitive, you can reduce the salt to 1 tsp, but don’t skimp on it too much… it really helps to balance the sweetness of the cooked vegetables. Bring soup back to a gentle simmer. Let it cook uncovered for 2 ½ hours, stirring every so often and adding water to the pot as needed to keep the soup from getting dry. In the end, you want the soup to be nicely thickened with a rich, meaty stock and tender, fall-off-the-bone meat. 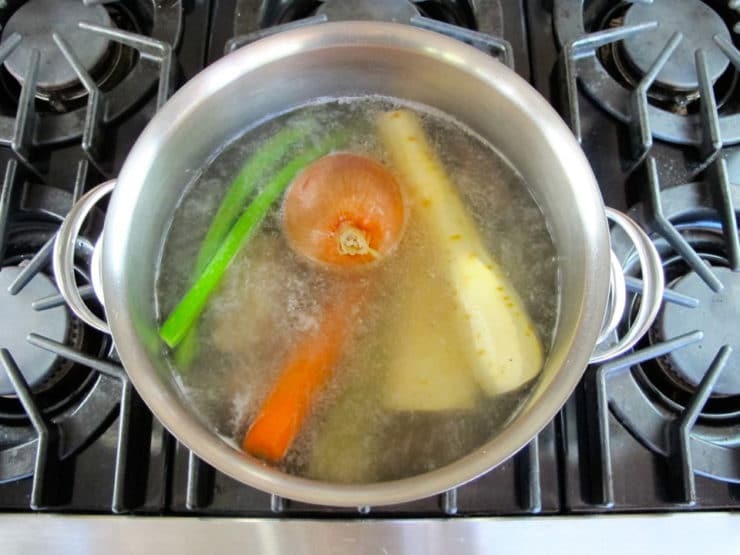 When the soup is finished cooking, remove the onion and celery and discard. Remove the carrots and parsnips and slice them into rounds. Return the sliced cooked vegetables to the soup and stir. You can add more salt or pepper to taste at this point, if you need to. I thought it was absolutely perfect as-is. You can shred the meat and remove the bones, or serve one short rib per bowl of soup. Make the soup a day ahead and refrigerate overnight to allow the flavors to develop more. Duff's mom recommends serving with a slice of rye bread and a little horseradish on the side. I can’t wait to make this recipe! July in South Carolina seems too hot for soup. (or is it…?) 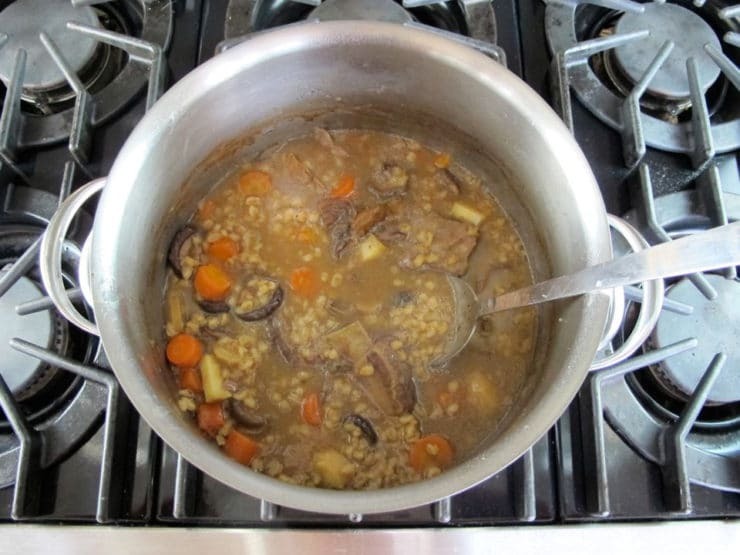 Seeing your photos reminds me of my Hungarian father’s mushroom barley soup. I haven’t had it in AGES. I will make this, and I will think of him all the while. Thanks for that. WOW WOW WOW!! This was OUT OF THIS WORLD! Totally the cold-weather comfort food I was looking for. It tasted exactly the way I had hoped it would and was just SO GOOD. I’ve been looking for a recipe for this soup for YEARS, but nothing really looked right when I read it….too many new cooks trying to jazz it up with some new funky ingredient….totally unnecessary if you’ve got the right recipe!! What’s the point of putting in the onion and celery and then removing them? I followed the recipe to the letter and it was so good that I’m not making any changes, but I was just curious. Oh – and it was nice to have the pictures because I’d have never known to put in the onion UNPEELED! That was a first for me! Hi Brianna, it is 2 oz. altogether. Enjoy! Wow, this is great! I wish I had known you were going to be in Baltimore 🙂 I would have brought you some mandel bread! Thanks to Duff’s mom for this awesome looking recipe. I adore barley and it’s always fun to try new recipes! Is there a gluten free alternative to barley? I’d love to make this! Hi Barbara! Try untoasted buckwheat groats. Even though buckwheat has the word wheat in it, it’s gluten free. I recommend the raw GF certified variety from Bob’s Red Mill here:https://www.amazon.com/Organic-Whole-Buckwheat-Groats-Gluten/dp/B0019H32G2?tag=theshiintheki-20 You could also use short grain brown rice. Enjoy! One look @ this soup and I knew it too! My maternal grandparents were from Russia, close to the Ukraine, and I know this recipe! It’s amazing. My Baba was the quintessential amazing cook in our family–so amazing, that her house was chosen for a Hadassah meeting with the guest of honour being Golda Meier, when she still lived in Milwaukee!! Thank you for your wonderful recipes! That is so cool Enid! What an honor to have entertained Golda. I hope she got pictures! Great interview and Delicious soup! I am loving all the pictures. OK so for all you guys who are gonna mess with this after I left strict instructions not to – I can say that my grandmother always had homemade chicken soup in the fridge (as well as a jar of her schmaltz) but for this soup, it is so rich already with beef flavor and thick w/barley that I’m not sure how much chicken soup would change it. The true MUST is the nice short rib in the soup plate bowl. Rye bread is a wonderful accompaniment but it’s pretty much a meal in itself. It’s not a pain to make either so if you want to be creative, OK I’ll grant permission, BUT if you stray too far off, come back to this original and you can’t go wrong. For Irish Stew, add a couple of largely cubed potatoes a little thyme or even rosemary, substitute a lamb shank or two in the pot and shred it up after it’s falling off the bone so everyone can have some meat. This look delish! thank you for sharing!! Hubby and I are fools for soups, stews, fresh veg and beans. Yummo!! My dad’s secret ingredient for the best beef barley soup is a tea ball full of pickling spice. I think it’s the fenugreek that gives it such amazing flavour! wonderful with shank for pesach. Are the cake mixes kosher?? Aside from the parsnip, which my grandmother only put in her chicken soup, this is the same recipe I’ve been using since I started cooking! It’s my favorite especially when it’s cold and dreary outside. Brings back wonderful memories of family long passed. Who knows, maybe we’re mischpucha!